Perfect Winter Sunday kind of food. I make this delicious chicken stew in my Le Creuset on stove top and put right in the oven, by now you all must know how very much I love one pot meals. All in it takes about 1 1/2 hours , that’s prep and cook and clean up! not bad at all for a lovely heartwarming stew that you and your family will love. I used Portobello mushrooms today but any kind of mushroom will do, cremini or baby bella mushrooms or just plain white button mushrooms will work out beautifully. 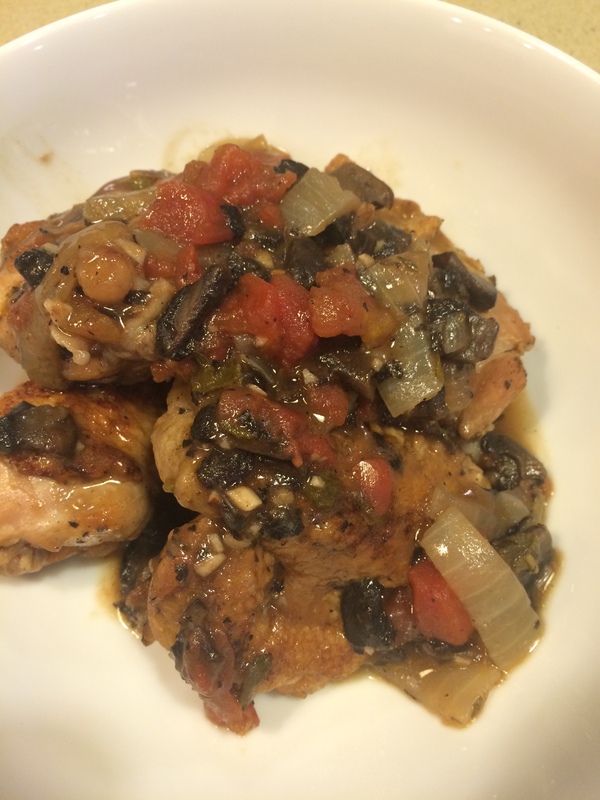 The Portobello Mushrooms gave the sauce a richer darker color and more savory flavor. A lot of these ingredients should be in your pantry already and although it seems like a lot of ingredients and prep it really is pretty easy. We are going to the movies (my kind of Sunday) so I prepped in advance, cooked for 1/2 hour in the oven and will heat it up after the movie. Follow the steps here and if you’re going to prep in advance , it’s super easy. 1 whole chicken , cut up in 8’s giblets and backbone removed– I used a small organic chicken and ask butcher to cut out backbone. I used about 1/2 lb. of Portobello mushrooms, chopped up but use whatever mushrooms you’d like. You can slice or chop makes no difference. Sometimes the whiter mushrooms look prettier sliced. The Portobello Mushrooms gave off a more savory flavor and a darker color sauce. 1 15 oz. can diced tomatoes with juice– you may want to add a little more tomatoes but 15 oz. should be enough. You will need a pot (dutch oven) that goes from stove top to oven. Le Creuset is what I use and love. It must have a tight-fitting lid as well. Set a rack in the middle of the oven and preheat oven to 375 degrees. I dry off my chicken with paper towels. Season the chicken liberally with salt and pepper. In a Dutch Oven or a large oven-proof pot which I spray with cooking spray, heat 2 tablespoons of the olive oil over medium-high heat until shimmering. Add 4 of the chicken pieces at a time, skin side down. Cook undisturbed until the skin is golden , about 5 – 7 minutes depending on the size of the chicken pieces. Flip the chicken pieces and cook until brown all over, app. 4 mins. more. Transfer to a plate and repeat with the remaining pieces of chicken. Set aside. Remove the Dutch Oven from the heat and cool off pot for a few minutes. With some paper towels wipe the pot clean. I re-sprayed and added 1 more tablespoon of olive oil. Heat over medium-high heat until shimmering again. Add the sliced onions, mushrooms and garlic. Cook, stirring occasionally, until everything softens and it smells amazing. App. 5- 8 minutes. Add the flour and cook, stirring constantly, until the flour is thoroughly mixed with the onion and mushrooms, about 3 minutes. Raise the heat to high and stir in the white wine, scraping up any brown bits at the bottom of the pan with a wooden spoon. Add the chicken broth, tomatoes and their juices, thyme, sage, bay leaf, app. 1 1/2 teaspoons of kosher salt, and 1/4 teaspoon freshly ground black pepper. 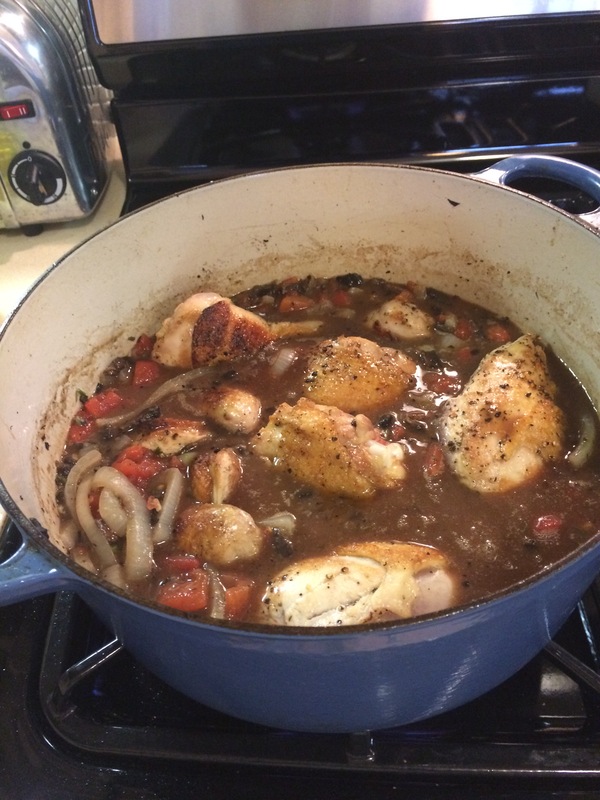 Reduce the heat to medium-low and add back in the browned chicken, submerging the pieces into the liquid. Cover and place the pot in the oven. Bake until the chicken is tender , about 1/2 hour. Take off the lid and bake for another 10 minutes or so. Remove the pot from the oven, and using tongs, transfer the chicken to a platter. Return the pot with the sauce to the stove top, turn the heat to high, and cook until the sauce is thickened, about 5 minutes. If sauce is too thick you can always add a little broth or water to thin it out. Remove the bay leaf, spoon the sauce over the chicken and serve. Yum! you can serve with rice, quinoa, whatever you like. A green salad would be perfect with some nice crusty bread for soaking up the sauce. This entry was posted in chicken, One Pot Cooking, stew and tagged chicken hunters stew, Chicken Stew in One Pot, hunters stew. Bookmark the permalink. Loving your recipes and so lovely for your daughters to have them all recorded here. Nice for us too!